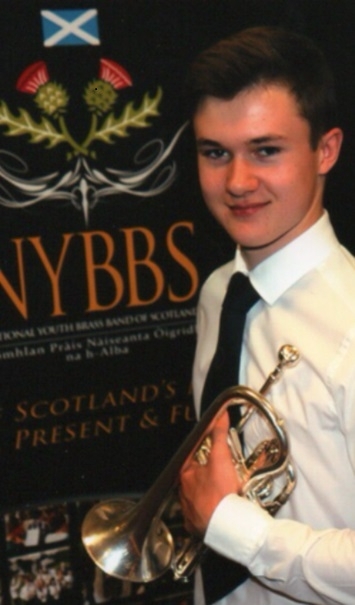 Funds raised from a coffee morning will help send cornet player Kyle Fitzsimmons to NYBBS. A COFFEE morning has raised more than £800 to send a Dumfries and Galloway cornet player to Norway in June to play with the National Youth Brass Band of Scotland (NYBBS). Kyle Fitzsimmons received £802.42 after the funds were raised by people at the event in Whithorn on Saturday, June 4, meaning he can attend the summer course at Strathallan School before enjoying a tour of Norway with NYBBS. Kyle was also presented with a cheque by Jeanette Duncanson, of the Faith Hope and Charity community shop in Whithorn before entertaining with a few tunes on his cornet.